Under New York law, a rear collision with a vehicle that is stopped makes a prima facie case for the negligence of the rear driver. It also creates a presumption that no negligence on the part of the lead driver contributed to the accident. If the plaintiff in such a case moves for summary judgment, the defendant must submit evidence of a non-negligent explanation. The Supreme Court for New York County recently considered whether the defendants had successfully rebutted the plaintiff’s prima facie showing in a rear-end accident in Cross v. Welcome. The plaintiffs’ vehicle was rear-ended by a New York City Transit Authority (NYCTA) bus. The vehicle driver and his wife filed suit against the bus driver, the NYCTA, and the city. The plaintiff stated that his vehicle was stopped at a red light when hit. At deposition, the bus driver testified that the light was green, but a traffic agent “abruptly stopped” the plaintiff’s vehicle because an ambulance was coming down the cross street. The bus driver said he was going about ten miles an hour and hit his brakes immediately four or five seconds before the collision. He said the collision was “just a slight touch on the vehicle” and was not aware of any damage to the car. The plaintiffs moved for summary judgment on liability. The court noted that a rear-end collision with a slowing or stopped vehicle establishes a prima facie negligence case and shifts the burden to the defendant to show there was a non-negligent reason for the accident. It also raises the presumption that the lead driver did not negligently contribute to the accident. The court found the plaintiffs had made the prima facie case against the bus driver and NYCTA. 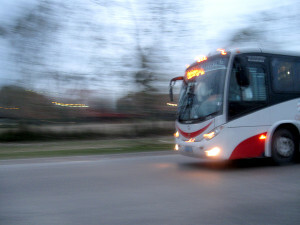 The plaintiff driver testified that the bus driver rear-ended his vehicle, and the defendants admitted in their answer that the defendant driver was driving the bus in the course of his employment with permission of the NYCTA. The defendants argued that the bus driver’s testimony gave a non-negligent explanation for the accident because the traffic agent unexpectedly stopped the plaintiffs’ vehicle even though the light was green. The defendant also argued that the driver’s testimony that he was driving just ten miles an hour and covered the brake indicated he was driving reasonably and would not have collided with the other vehicle but for the traffic agent’s actions. The court rejected this argument, finding the defendants failed to raise an issue of fact that would preclude summary judgment. Although the parties’ accounts of the collision conflicted, the defendants had failed to rebut the presumption with a non-negligent explanation of the accident to rebut the presumption even under their own account. Looking to cases in the Appellate Division, First Department, the trial court found that the “vast majority” held that a sudden stop alone was not enough to overcome the presumption. Furthermore, the court found that a lack of damage to the plaintiffs’ vehicle was also insufficient to rebut the presumption. The court granted the plaintiffs’ motion for summary judgment as to liability against the bus driver and the NYCTA. As this case shows, a rear-end collision is strong evidence of negligence against the rear driver. Sudden stops or minimal damage to the vehicle are not generally enough to overcome the presumption of negligence. If you have been seriously injured in a rear-end automobile accident, an experienced New York automobile accident attorney can help. Call 1-877-313-7673. The Law Offices of Nicholas Rose, PLLC offers free consultations.